It will automatically operate the manuals, pedals, stops, couplers and swell. It is optimised for playing multiple organs simultaneously. You can run two or more copies of eplayWin32 and when you tell one to "play" all copies will start playing together. Version 3.2 and later have an improved algorithm for activating the stops on w165 organs - all previous versions made errors when w165 stops were simultaneously opened and cancelled, particularly noticeable on the later rolls when played on eplayOrgan (on which you can see precisely what is happening). Version 4.0a still includes all of the previous features. It has been compiled with the latest minGW32 compiler, has improved and additional organ data and plays Hauptwerk Burea Church organ using Lars Palo/Graham Goode's sound font. 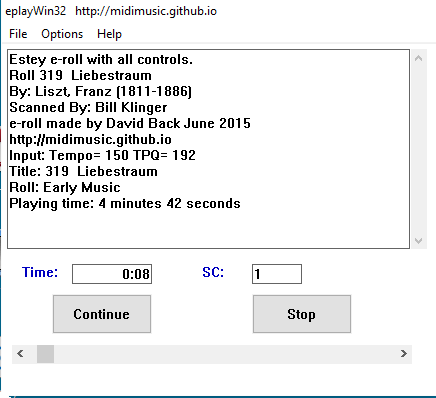 You can drag and drop your Estey or Wurlitzer e-roll files on to eplayWin32 and it will immediately play them. It plays almost any organ which can be played from midi keyboards, including Hauptwerk, Miditzer, GrandOrgue, Viscount, Allen, jOrgan and eplayOrgan. Organs included (already set up): eplayOrgan. See eplayOrgan multi purpose organ. More organs can be easily added. All the organ data is stored in an easily edited .xml file. Version 4.0 and later include a new playlist feature for each organ. You can play multiple files one after the other without any breaks or attention. I have included the usual Windows Installer option in the zip, this will automatically install eplayWin32. Alternatively eplayWin32 will work just as well if you manually install it by copying it and its supporting files to any folder on your PC. It will even work from a memory stick. For your convenience I have included a folder with all of the files in the downloadable zip. Download setup_eplayWin32V4_0a.zip The Latest Version. If you play Wurlitzer 165 eRolls or Allen organs this version is a necessary update. If you want to use eplayWin32 on a Mac this version is a necessary update. Version 4.0a will install and run just the same on an iMac and Linux as it does on Windows. 64 bit systems preferred but will also work just as well on 32 bit systems. For videos of eplayWin32 working with eplayOrgan, see eplayOrgan link above. Eplayestey updated to indicate New Music Stages and to play all Estey e-rolls. New purpose designed soundfont for eplayestey, immense improvement particularly for stage 1 and 2 new music. Download eplay_package_v3.4.zip Directly plays Wurlitzer and Estey e-rolls (Windows Only). Download eplaymacpkgV3.4.zip Directly plays Wurlitzer and Estey e-rolls (iMac Only). Download eplayfonts_v3.4.zip SOUND FONTS, NECESSARY FOR BOTH EPLAY PACKAGES ABOVE. Android Audio Apps You can download these apps and use them on your phone or tablet. Android Video Apps You can download these apps and use them on your phone or tablet. Wurlitzer Paper Music Roll Scanning How Wurlitzer midi files are made. Midi Specification Standard Midi File Format. Playing Speed of Piano Rolls Discussion. How to Play Wurlitzer Band Organ Music Rolls Detailed information. Summary table, 1929 Wurlitzer Band Organ Catalog Organs using 125 and 150 style rolls. Wurlitzer Caliola Tracker Bar Technical details. Violano Virtuoso Tracker Bar Technical details. Estey Player Organ Tracker Bar Technical details. How to play Estey Music Rolls Producing Sound Fonts, Technical details. Internet Protocols An Introduction to the Internet. Translate Organ Midi Files so they willplay correctly on other organs.